There are a few ways to store your shoes. The best option for you depends on 1) how many pairs you own and 2) what space you want to keep those shoes. Some people prefer by the door they most use to enter and exit the house. Some prefer that everyone keep their shoes in their bedroom. So, figure that out first, if you can. What will make your life more convenient? What will everyone in the house be able to live with? Then, figure out which shoes to keep. You know the drill! After that, address the space. Will you need a tiered flat surface, much like shelves? Will you want slots or pockets on the back of a door? Will you need something narrow and tall, where hidden pockets tilt out of a door? Maybe you prefer a circular, tiered rack that you can slip your shoes on? Just make sure you measure the space before you buy anything new. If it doesn't fit comfortably in the area, you aren't going to want to use it. 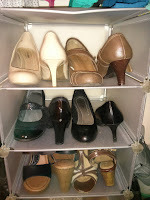 Pro Tip: If you're going to store shoes on a flat surface of any kind, placing shoes toe-to-heal saves horizontal space. If you have a lot of shoes, the space saved can really add up, too!